It’s that time of year again, with Christmas quickly approaching, and Absolutely Corporate has a huge range of great Christmas ideas. Whether you’re considering one of our core services like Corporate Massage for your workplace in the New Year, or perhaps looking to add Corporate Yoga or Corporate Fitness to help your staff stay fit and healthy, we can help you organise the perfect solution. Now’s the perfect time to start organising a health program for the New Year and Absolutely Corporate specialises in offering flexible, tailored programs to suit any workplace. Another popular Christmas event are always our Christmas Extravaganza charity fundraising events, with our partners Arbonne Consultants. We can set up over lunchtime and your team will be able to explore and sample our beautiful range of skincare, bath, body, cosmetics and health and wellness products. They’ve even just launched a new limited edition product line for Christmas gift giving, including beautifully packaged hand creams, shower gel sets, foot pamper sets and more. Orders can be placed on the day or it can simply be a fun way to have a break and boost morale at work. Even better, is the fact we can donate 20 per cent from every sale to a charity of your choice or include a $25 donation which redeemable on each product order of $75 or more. It’s the perfect opportunity to organise some exclusive, thoughtful Christmas gifts in a relaxed environment at the convenience of your workplace, all while helping a great cause, in the charity of your choice. Contact us now for an individualised health and wellness program, or to organise your own Christmas Extravaganza and you’ll be organised and ready to go before the stress and business of Christmas takes over. 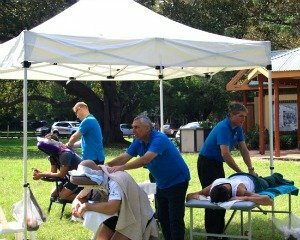 It might even be a good time to organise some Corporate Massage heading into the silly season, to help keep your workplace a happy, healthy and productive place! You can contact us from our Contact page.